Born: 1796, Place not known. Died: 1858, Place not known. Paul Gaimard was a French naturalist. In 1824 Jean R.C. Quoy* and he described the fishes collected by the expedition of Louis C.D. de Freycinet* in 1817-1820, in one of the volumes of Freycinet's Voyage autour du monde.... According to Pappe (1866) they were part of this expedition and collected sea fishes at the Cape in 1818, being the first scientists to do so. From 1826 to 1829 both Gaimard and Quoy served as naturalists on the French ship L'Astrolabe during a voyage around the world under the command of J. Dumont D'Urville. They visited the Cape, where the naturalists collected shells around Table Bay and the Cape Peninsula. The results of the expedition were described in Voyage de decouvertes de l'Astrolabe, execute par ordre du Roi, pendant les annees 1826-1829..., a multi-volume work published in Paris in 1830-1835. The zoological descriptions were written by Quoy and Gaimard, and included South African molluscs, but only two species of fishes from the Cape. Meanwhile Gaimard, with Quoy as co-author, had published over 20 papers during 1824-1830, most of them in the Annales des Sciences Naturelles, in which they described numerous zoological specimens collected by the expeditions of Freycinet and D'Urville. 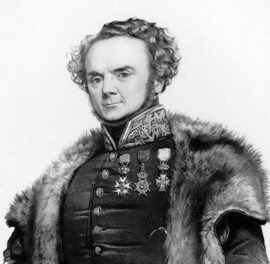 In 1835-1836 Gaimard accompanied an expedition in La Recherche to the Arctic Sea, Iceland and Greenland, as head of the scientific staff. He published an account of this expedition, Voyage en Islande et au Groenland (8 text volumes plus a volume of geographical illustrations) from 1838 onwards. Kilburn, R. & Rippey, E. Sea shells of southern Africa (p. 18). Johannesburg: Macmillan, 1982. National Union Catalogue, pre-1956 imprints. London: Mansell, 1868-1980. Pappe, L. Synopsis of the edible fishes of the Cape of Good Hope, 2nd ed. Cape Town: Brittain, 1866. Standard encyclopaedia of southern Africa (Vol. 4, p. 545). Cape Town: Nasou, 1970-1976. Wikipedia, the Free Encyclopedia. https://en.wikipedia.org as on 11 November 2008.